Forget about the complex task of building your own solution. 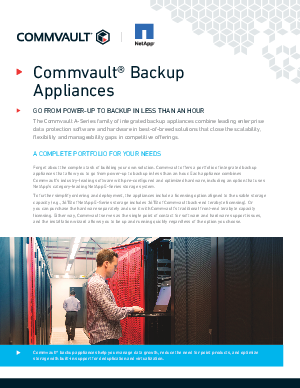 Commvault offers a portfolio of integrated backup appliances that allow you to go from power-up to backup in less than an hour. Each appliance combines Commvault’s industry-leading software with pre-configured and optimized hardware, including an option that uses NetApp’s category-leading NetApp E-Series storage system. Either way, Commvault serves as the single point of contact for software and hardware support issues, and the installation wizard allows you to be up and running quickly regardless of the option you choose.